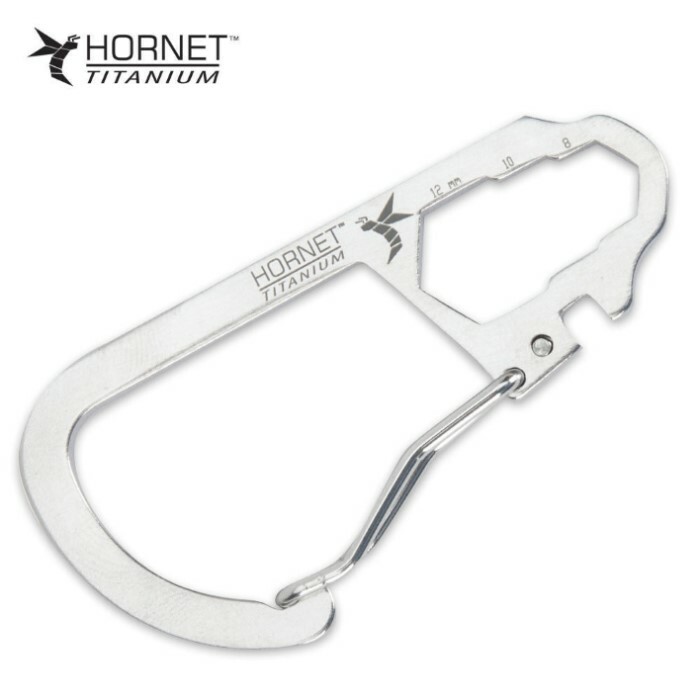 Hornet Titanium Carabineer | BUDK.com - Knives & Swords At The Lowest Prices! You'll be glad you made your purchase every time you reach for this Hornet titanium carabineer! Its titanium design features a sandblasted finish complete with a wrench, ruler, and bicycle wire steel. The carabiner itself is nice and looks exactly like the picture. The PROBLEM is with the 'Bicycle wire steel' gate. It comes off, easily. There is nothing to keep it in the holes that hold it place. Normally, the ends are capped or flattened to prevent pop outs. You can see in the picture that it's just held with torsion and optimism.